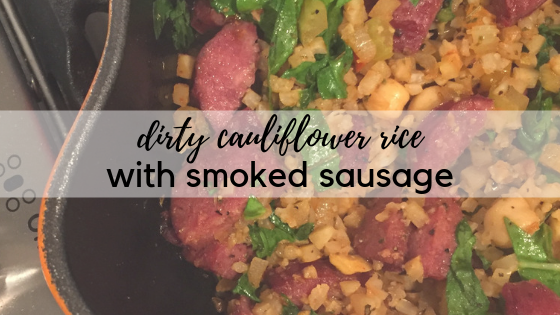 This quick meal is one of my very favorites….thankfully my family likes it, too! If your kids aren’t fans of celery and peppers, dice them into very small pieces and they’ll soften right up as they cook. I always make enough for leftovers (double the recipe) so we have extras for lunches throughout the week. Warm 1 tablespoon olive oil in large skillet over medium-high heat. Add smoked sausage and sauté until lightly browned. Remove to plate and keep warm. Add remaining olive oil to pan and swirl to coat. Add onions, peppers and celery and sauté until softened, about 5-7 minutes. Add cauliflower rice and sauté another 3-5 minutes. Add the spices and broth and mix well. Taste, then salt and pepper to taste. Add sausage back to pan, reduce heat and simmer about 10 minutes.